ALLGRIND PLASTICS - is a custom processor providing a wide range of size reduction service for plastics and other materials. such as plastics and similar materials. Allgrind has been servicing the plastics, chemicals, additives, and bulk dry materials industries since 1978 from its New Jersey plant. Allgrind provides a toll processing service for your materials. We offer grinding services but do not buy or sell materials or machinery. Coarse Grinding / Granulation from any size pellets, sheets, pieces or parts down to 2" - <1/8" or 50 - 2mm. Fine Grinding / Pulverization / Cryogenic Grinding to 6 - 200 mesh or 3000 - 75 microns and finer for friable materials. Sifting/Classifying to 3/8" - 200 mesh or 10mm - 75 microns. 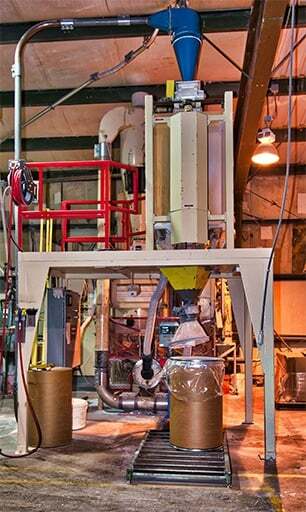 Blending/Mixing of any quantity in batches from any size up to 5000 lbs. Packaging and re-packaging from and into any containers. Sifting and blending services are offered separately or in conjunction with grinding to further classify, blend, and improve your final product.